On the Stream page of your class, click Select Theme at the right. In the Gallery dialogue box that appears, click either the Gallery or Patterns tab. Basically, Gallery gives you photos or artwork to use as your background image, and Patterns gives you some abstract designs to choose from. Click the theme you want and click Select Class Theme. The visual theme of your class changes to what you chose. 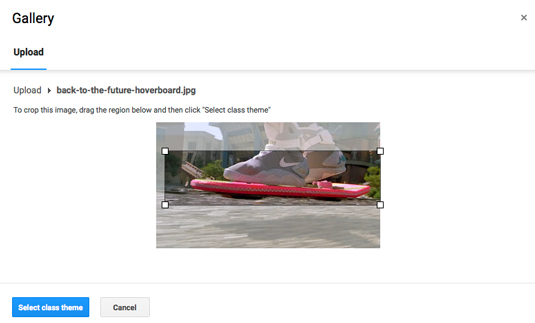 You can also upload your own photo to serve as the background image of your class. So, if you’re teaching Flying Skateboards 101, you can upload a picture of your prize-winning super skateboard. When you upload a photo, the color scheme of the class also changes to match. On the Stream page of your class, click Upload Photo at the right. In the Gallery Upload dialogue box, either drag and drop a photo from your hard drive or click Select a Photo from Your Computer to navigate to the photo you want to use. After your photo uploads, you see it displayed with a crop box overlay. Use the corners of the crop box to adjust the size of the box (see Figure 2). When you’re ready, click Select Class Theme. The visual theme of your class changes to the photo you uploaded. Figure 1: Uploading your own photo.